A palette list is a file containing all of the links to the palette files. Each scene created has its own palette list. 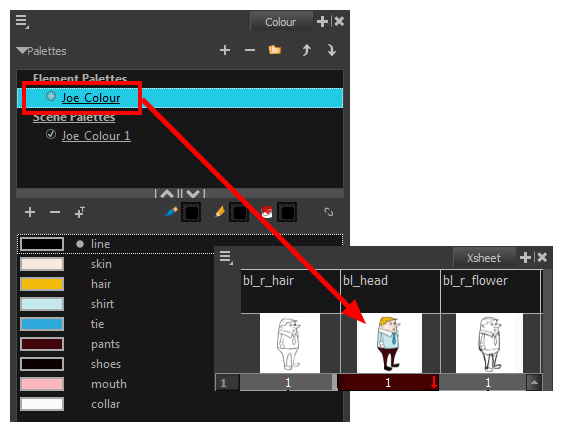 However, it is also possible to assign palette lists to individual layers in a scene. To be able to do that, you must first enable Advanced Palette Lists mode—see Enabling the Advanced Palette Lists Mode . The scene palette list is simple to understand and convenient. Every element in your scene can use colours from a palette in your scene's palette list. This is especially useful for digital animation, as a cut-out character model will often be divided into dozens of different layers which will all use the same palette. 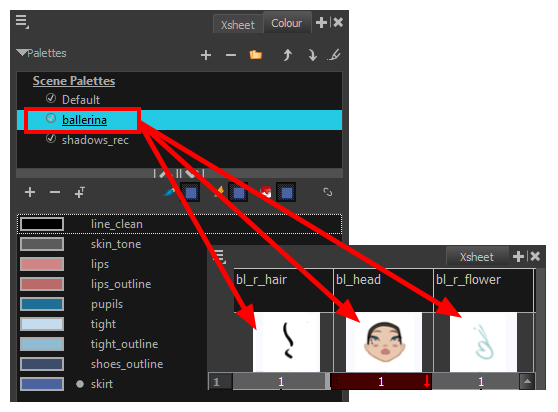 The scene palette list is stored inside the scene's directory in a file named PALETTE_LIST, and its palettes are usually located in the scene's palette-library subfolder. An element palette list is a list of palettes that is associated to an individual layer (element) in your scene. Only the drawings inside that element are able to use the colours in the palettes of its element palette list. The palettes in an element palette list will only be visible in the colour view when a drawing from that element is selected. This can be useful if you are doing traditional animation in which characters are usually drawn on a single layer, so you can assign each character to their individual palette. An element's palette list is stored in a file named PALETTE_LIST, inside the element's directory in the scene's elements subdirectory. An element's palettes can be stored in palette-library subdirectory of the element's directory. If you have the Advanced Palette List preference enabled, then you can build a palette list by creating palettes in different locations, or linking to palettes from different locations. You might notice that the icon left of each palette in the list looks different depending on where the palette is sourced from. The following is a table explaining the meaning of each icon in the list.